It's that time again where I round up my favourites from the month. 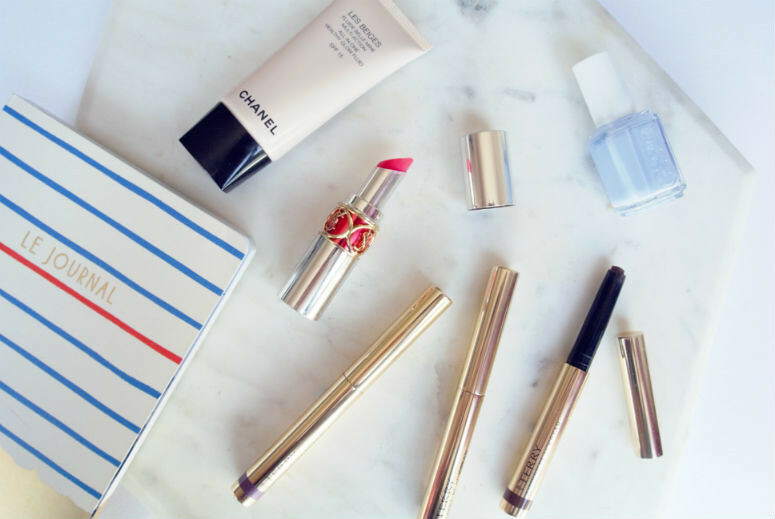 The very short heat wave we had in London at the very beginning of the month had us all fooled I think, we were all so ready to crack out the shorts and hit the parks, which was the main reason I bought the Chanel Les Beiges Healthy Glow Fluid. Even though the hot weather in the UK didn't last particularly long, I really enjoyed using this as my daily base. This worked out even better while I was on holiday in Greece, because it is so lightweight on the skin, and managed to even out light discolouration on my face, and put up a very good attempt at hiding my scars. It still needed a bit of help from some concealer, but it was exactly the base my face needed for nights out in 30C temperatures! The next favourite has to be my much loved YSL Volupte Sheer Candy in Pomegranate. I'm sure I've shown this more times on the blog and Instagram than I care to remember, but I adore this product. Lightweight and glossy, but with a good whack of colour that somehow still leaves a stain even after eating, this is one of my go-to lip products, and I carry it around with me always. This was especially great for me during my holiday because no one really wants to walk around in ridiculously hot temperatures feeling their lipstick on them, so this worked perfectly. Essie Saltwater Happy has to be one of my favourite limited edition launch from the brand. It's a gorgeous light blue that is very similar to their Bikini So Teeny, but ever so slightly lighter. Lapiz of Luxury used to be my favourite blue from Essie, but this has surpassed that completely. Read my review of it here. Finally, my By Terry Ombre Blackstar eyeshadow sticks really came into their own in my mind this month. I usually use Misty Rock anyway on a daily basis, because it's such an easy to wear shade for the office, but my decision to not pack eyeliner with me for my holiday left me slightly bereft. The shades Brown Perfection and Velvet Orchid completely negated the need for eyeliner. They doubled as eyeliner and eyeshadow for nights out. Brown perfection worked perfectly for more subtle smokey eye, while Velvet Orchid gave off a far more sultry look, even if I do say so myself. I'm seriously thinking about buying another shade because they go on so easily, and stay on all night. These eyeshadows may just well be my favourite eye products of all time! What were your favourites for July? I love favourite posts! I've never tried YSL lipsticks before but they look amazing. Lovely post!